Even though My Kiddo's Birthday Party is still months away, I just can't help but work as if it's next month. 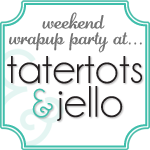 I am so excited about how super-cute this party is going to be! People might think I am crazy for doing this, but I actually try to draw mock-ups for most of the parties I throw. This way I am not surprised come the day of the party about how things look. I also think it saves me money in the long run as well. If I know exactly what I need and the look I want to achieve, I won't be tempted to buy extra stuff that may or may not fit in with my previous design. I hope you enjoy your little peek into my brain. Also, my mock-ups are pretty basic, so I hope you weren't hoping to see some awesome artwork. Needless to say, you won't find THAT in these. 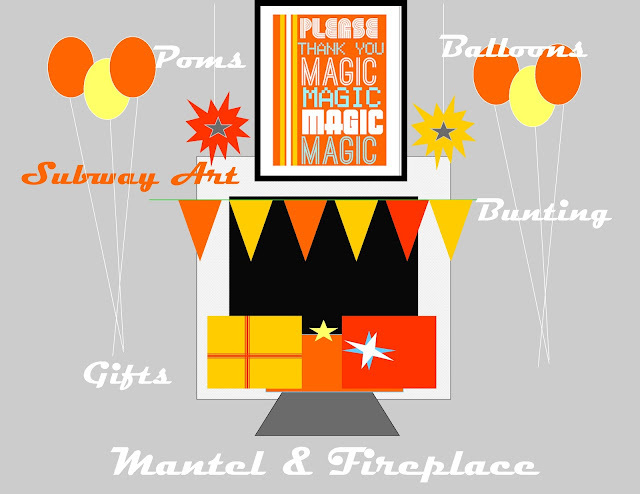 The opening graphic will be the mantel and living room area. I am going to stick with oranges, reds, and yellows in that area. I also plan to make a personalized subway print in the style of the "Magic" artwork. 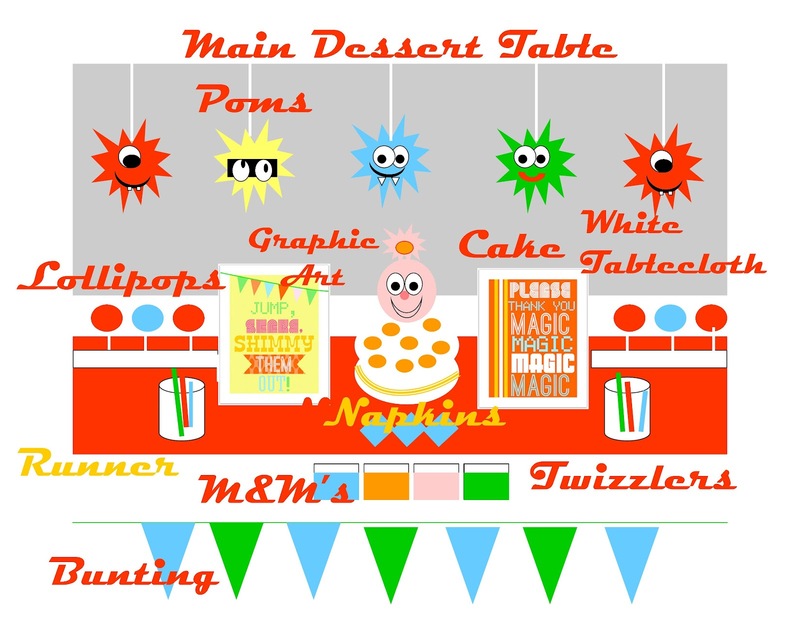 For the main dessert table, I am planning to make tissue paper poms with Yo Gabba Gabba Faces. I will use two more of the graphic art images I made to flank the cake. I plan to do minimal candy, since her birthday is so close to Halloween. 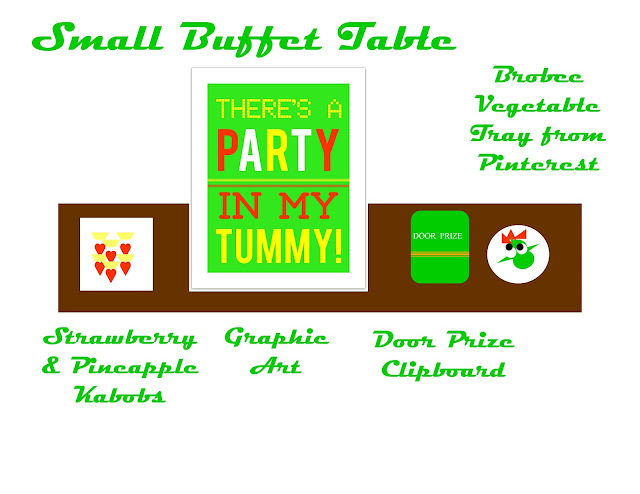 My small buffet table will have the veggie and fruit trays, in addition to the door prize clipboard with Brobee colors. 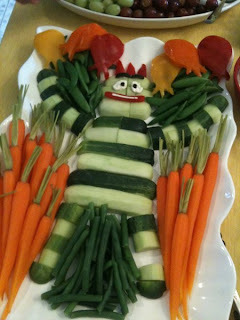 I plan to do the Brobee vegetable tray pictured below that I found on Pinterest. I also utilized another one of my graphics. Image from the Wendy Will Blog. 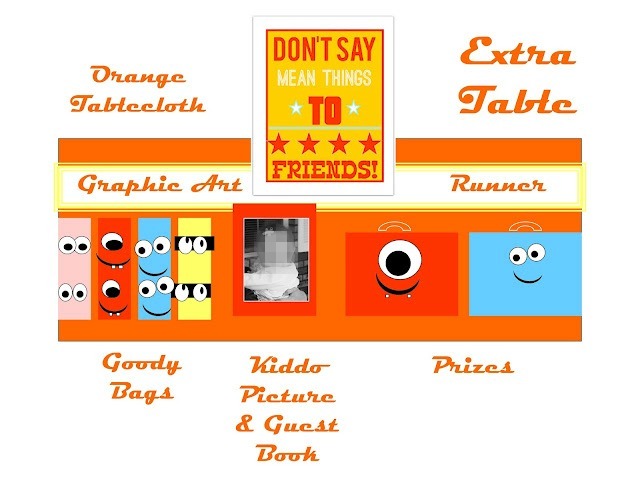 The next table is going to be where I keep the goody bags and such, along with the actual prizes. I like to also put a picture frame for guests to sign. Yes, I admit I am crazy for doing this. But, I am a very visual person and I love that I can see exactly what it will look like-NOW.